Many can relate to seeing a striking building or a home improvement project typically created from wood. However, there are various ingenious carpentry from around the world who astound with their projects that are both unique and unconventionally constructed. These masterpieces clearly illustrate the versatility of wood. The array of metal combination locks are used by millions of people around the world. Matthias Wandel decided to take woodworking to the next level when creating his fully-functional lock that is nearly entirely made from wood. The device serves as a great illustration of the inner workings of a lock. Disgruntled by the amount of aluminum and plastic plaguing the planet, designer Marlies Romberg determined to create computer components from wood. The monitor frame, mouse and table are completely wood-based. The unusual table additionally features a built-in keyboard, which is also made from wood. While the traditional gun is manufactured using steel and sprays an array of bullets, this unique functional weapon is made from wood and only shoots rubber bands. The artistic lamp was created by U.K. Designer Barend Hemmes and resembles a giant lightbulb. The lamp is available for retail and works using conventional bulbs of up to 60 watts. 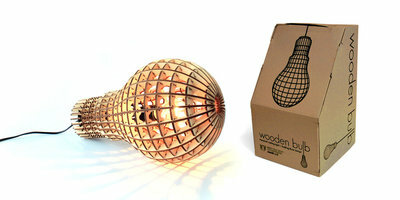 The unique design of the laser-cut wood enables owners to hang the lamp or merely lay the bulb on its side. The supercar features a mid-sized engine and is constructed of composite wood. Graduate students from North Carolina University created the unique vehicle that weights 2,500 pounds and features more than 600hp. Wood makes up the body, chassis, suspension and the wheels. Using a decommissioned scooter as a guide, Portuguese woodworker Carlos Alberto recreated the entire body, seat and tray of a Vespa from various species and colors of wood. Each layer was steamed, bent and plastic-coated before assembled onto the vehicle. The finished piece is not only functional but serves as a work of art. A Hungarian woodworker constructed this unique motorcycle, which is based on an actual 1895 vehicle designed by engineer Gottlieb Daimler. With the exception of the gears and engine, the steampunk-looking creation consists entirely of wood. Created by WEwood fashions, the earth-friendly timepieces are manufactured using scrap wood and Miyota inner movements. A company in Italy was the first to devise the concept and they have since worked with American Forests to expand forests.